Critical has always been a strain that’s among the favourites for many cannabis enthusiasts. She is one of these highly rewarding strains that impresses with incredible growing vigour, extraordinary resin production and a spectacular high. Obviously, Critical XXL Bulk Seeds by Zambeza doesn’t carry the “XXL” in her name without a good reason. This improved variant of this legend had been specially bred to ensure even higher yields and production! What growers love about Critical XXL is her very short flowering time of only 50-60 days where they can expect superb indoor yields of up to 650g per square metre. If you choose to grow her outdoors, the plant can reach an impressive 2.3m and reward with a staggering 750g of dank bud at harvest time. Critical XXL may indeed grow such an abundance of fat, dense and resinous buds that it can be recommended to support her during growth. So keep those stakes or grow nets handy to help her carry her massive load during growth, she’ll thank you for it later on! When smoked, you will love Critical XXL’s spicy aroma that mixes notes of cloves with a flavour of orange peels and some Skunky notes, sure reminding the smoker of her aromatic Skunk parent. Her dank, deep and heavy smoke like that of the finest hash from Afghanistan is very potent, no surprise there given that she has been measured up to 19% of THC. Critical XXL’s makes for a heavy and incredibly relaxing physical stone like you’d expect from a true first-class indica. Critical XXL Bulk by Zambeza blends two legendary strains into an enhanced version of the acclaimed Critical who by herself has quickly gained legendary status among cannabis enthusiasts. With yields and production that are out of this world, a superb taste and a super-relaxing high you won’t find a reason not to grow this spectacular strain! 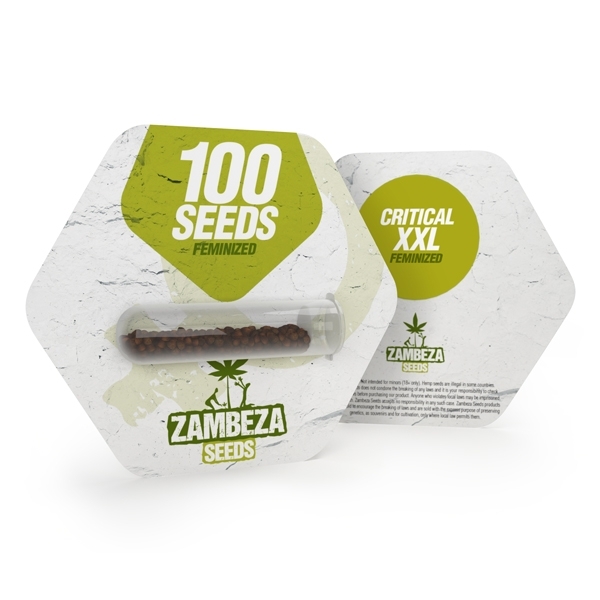 At Zambeza Seeds you can get Critical XXL Bulk Seeds in packs of 100 seeds, making it an economical choice for cannabis cultivars.